It might have been as long ago as Barcelona, I can’t remember, the first time I heard this story about Ljubljana. Standing outside somewhere warm a young man, medium length blonde hair talking to me as much with his flailing arms as with his voice. The message was clear though. 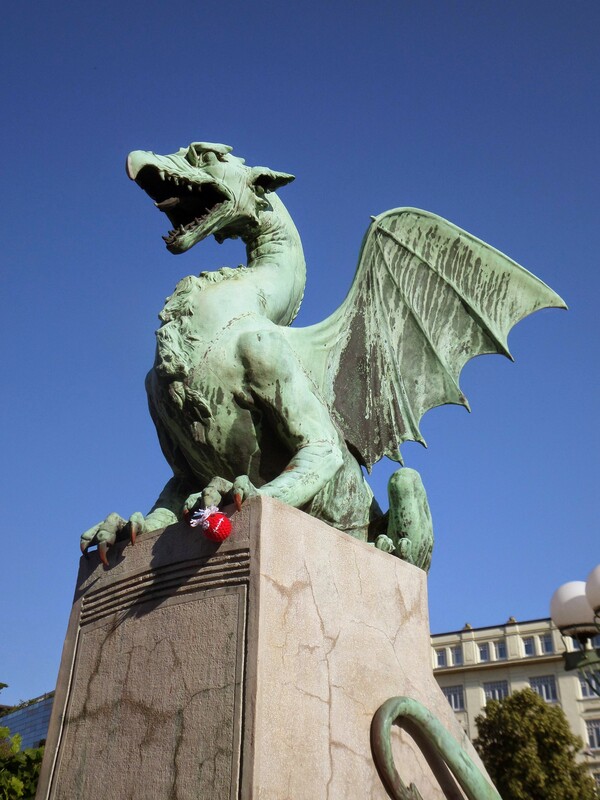 He was passionate about Ljubljana. Not surprising then that Sarah and I had agreed to visit when planning a rough trip outline way back in Montenegro. Now, leaving Zagreb, the thin black lines on the map would direct us there in no more than a few hours, following the small roads once again, avoiding the need for a motorway vignette. 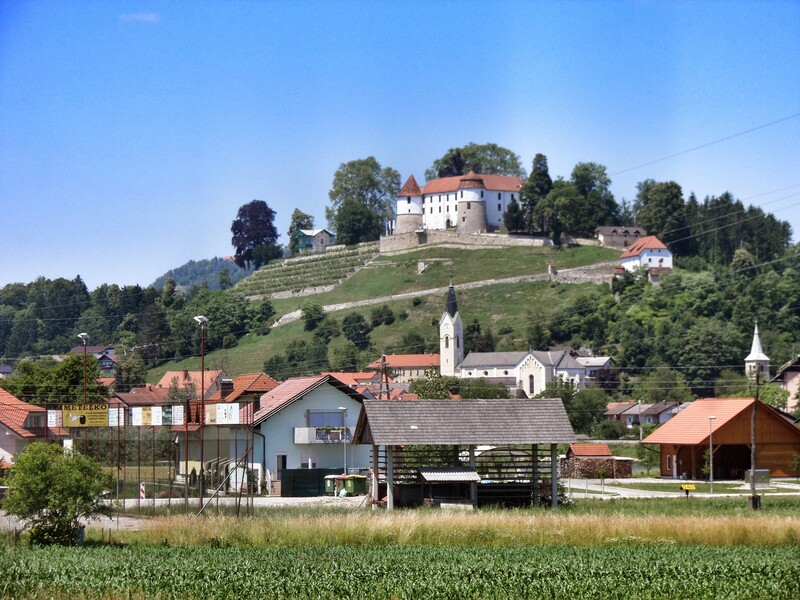 The Croatian-Slovenian border crossing at Bregana and Slovenska vas was a small two lane affair, just North of a modest looking farming town. I’d stopped in a bay to prep paperwork and talk to the police forgetting that Slovenia was in the EU. In the end, after all the earlier rummaging, we only turned over our passports to customs before we were waved on our way. The houses melted away, replaced by sprawling green and golden farmland. The lush fields and forests were interspersed regularly with isolated houses or small villages of brightly coloured, wooden buildings. Everything was prim and proper – well looked after. 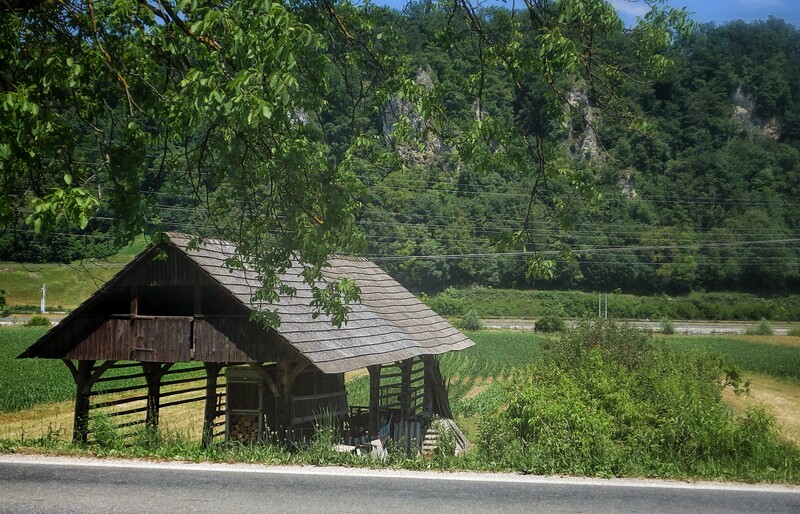 Our first impressions of Slovenia were exceptional. The first leg of the journey mirrored the motorways closely, so closely that we’d catch long glimpses of the cars as we undulated past slip roads and underpasses on a quiet stretch that curved smoothly through more small villages and woodland. Under satnav guidance we broke away from the motorway we headed into slowly deeper valleys in the north. Getting more and more drawn into the scenery, we struggled to capture the natural beauty thanks to a million power cables dominating the lens wherever it was pointed. In real life it didn’t matter too much. Castles and, obviously, power cables. The tree cover occluded any view apart from the tarmac snaking round the next sweeping bend. We were hugging a side wall of the valley we’d chose to dart along, taking it as it comes, enjoying not being under the full sun for a while. Picking up speed my eyes hawked in only on the road in front – noting how the surfaces changed, where the vanishing points were around corners, checking for debris or tail lights. My focus floundered when we broke out of the woodland near the town of Trbovlje and into the shadow of an engineering behemoth. 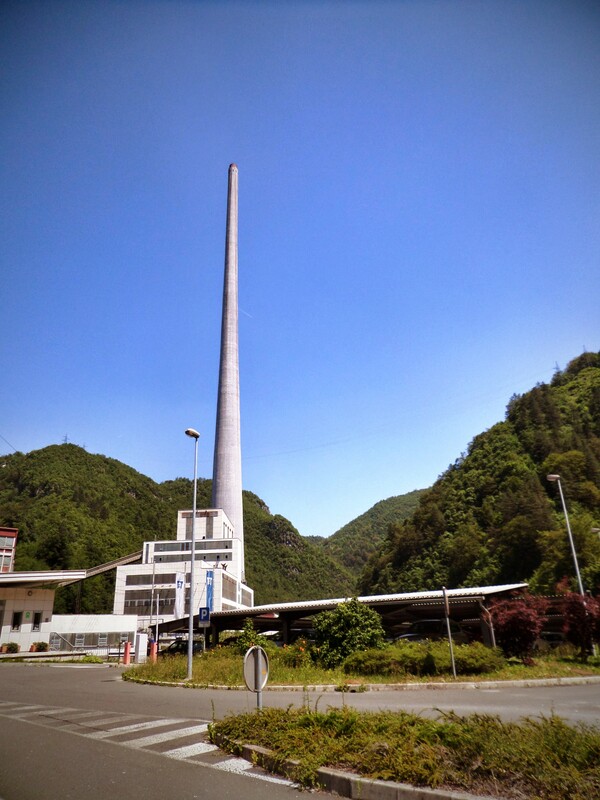 This is the best view of Trbovlje Power Station I could shoot – worth a Google to show how it dwarfs the valley around it. I hadn’t been expecting anything exceptional apart from the scenery and par-abandoned roads. Stopped in the driveway of the largest chimney in Europe, seventh largest in the World, I couldn’t help but gawp and crane my neck back for a better view. 360 meters is tall. 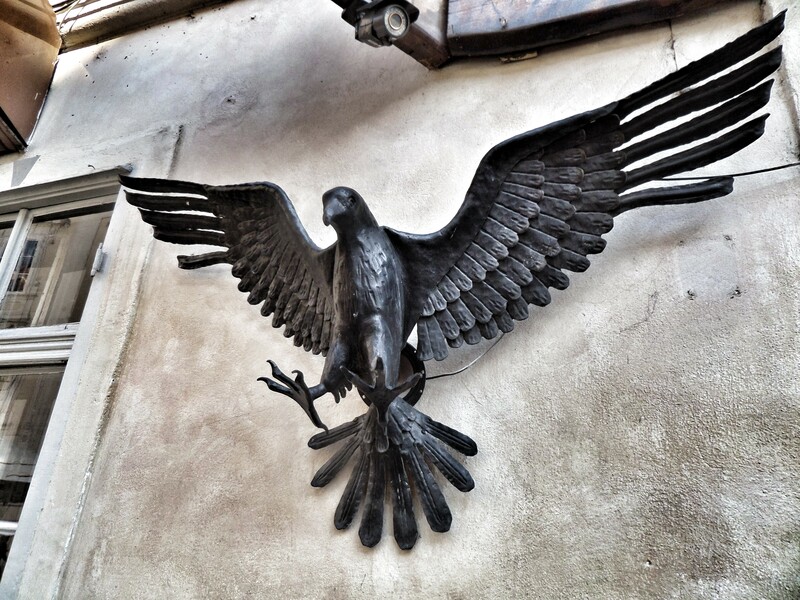 I tore myself away with the objective of hitting Ljubljana as soon as possible. Sarah delighted in her growing confidence as a pillion film-maker, shooting vague footage of chasing train carts and riding rickety looking wooden bridges for the thrill of it (tooyoub clips). 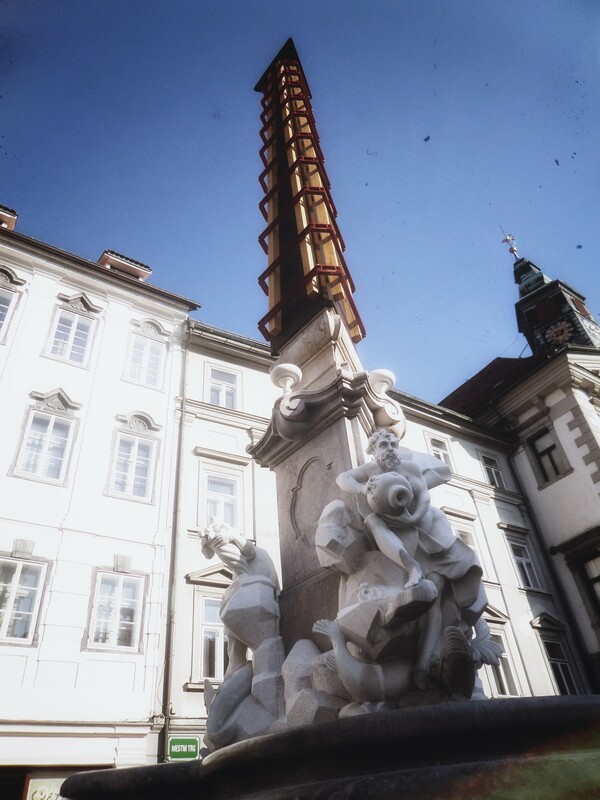 We found Ljubljana easily enough by following street signs, but kept failing to find anything resembling a centre. Bundling sweatily under sun parasols of a cafe/restaurant the waiter bought us water even though we weren’t ordering, then told us the wifi password so we could find a hostel nearby. Usual story, but just so happens that Ljubljana holds the number 1 hippest hostel as rated on lonely planet – an ex prison block. How could we not? It was after a couple of failed navigation attempts Sarah disembarked to do a more thorough foot patrol of the block the GPS had led us to. Hopping back on the bike Sarah pointed to the end of the road and told me how to find the entrance. Less than a minute later we were crunching slowly over fine grain car park gravel in what was the most unusual looking hostel I’d ever seen. Bohemian looking people wandered around in sandals wafting their dreadlocks around. Graffiti covered three of the three outside courtyard walls. The place resembled an inner city hippy commune. Walking past a vivid yellow building we noticed a wall of sculpture and artwork to our left, then the hostel on our right. I went back to move the bike right outside the door, cutting out the hassle of lugging panniers around. Half an hour of wandering around with the bags, hunting down a shop for water and chocolate and faffing about in a hammock was all the preparation we needed to re-energize before a walk round the city. Exactly what it looks like. But laziness has its advantages. 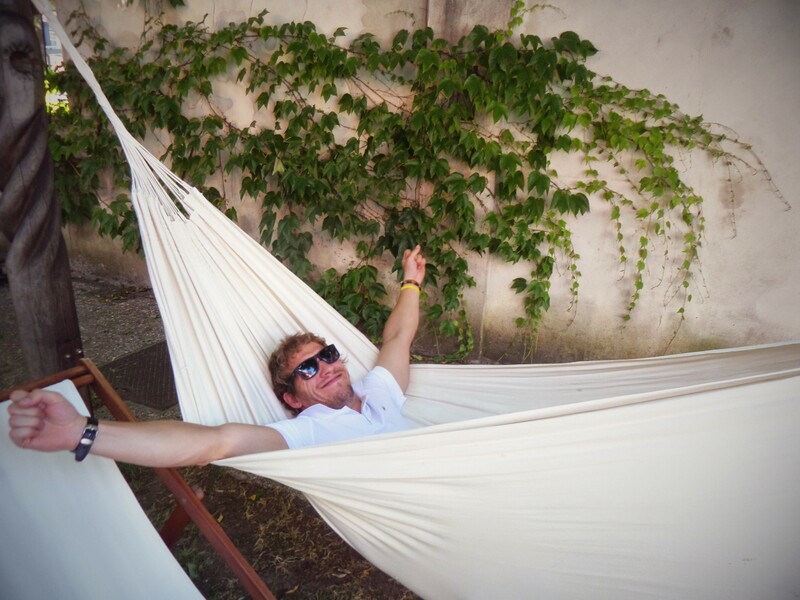 I found a phone in this hammock! Win for the big guy (until I had to give it back). We’d passed these earlier on the way to find wifi. Two dragons guarded either side of the bridges into the city. I was looking forward to this water. Apparently it’s so clear you can see the rocks at the bottom under 3m of water. Apparently I’m too gullible, or my ad hoc travel guides were – unless they just saw the reflection of the walls in the water? Can’t be. Maybe. If I knew anything I would talk about the fusion of new and old. A working juxtaposition. Fortunately for you I don’t know anything. So here’s a picture of a fancy radio antenna or something. 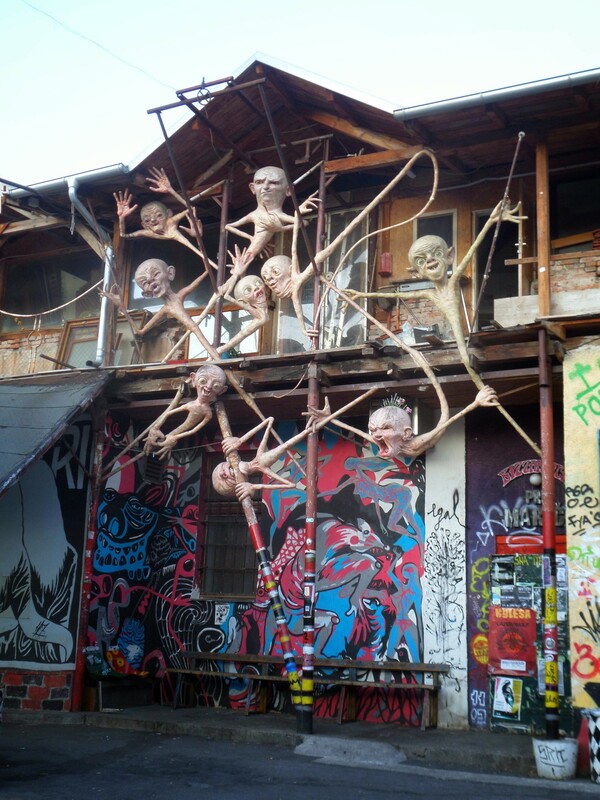 Ljubljana is really giving off the art house vibes – sculptures everywhere, frescoes abound and streets of tasteful graffiti. This was on the wall to a pub. It’s all right isn’t it? Even the cathedral had got involved. 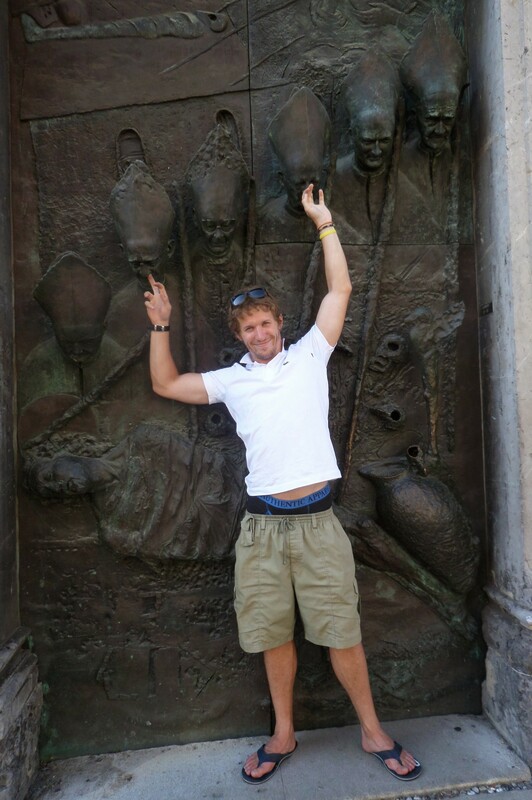 Here I am getting my belly out while gently caressing the nasal passages of pointy hatted men. Typical Tuesday afternoon. Sarah, spooked out by cast bronze sculpture doors went to look at something pink. 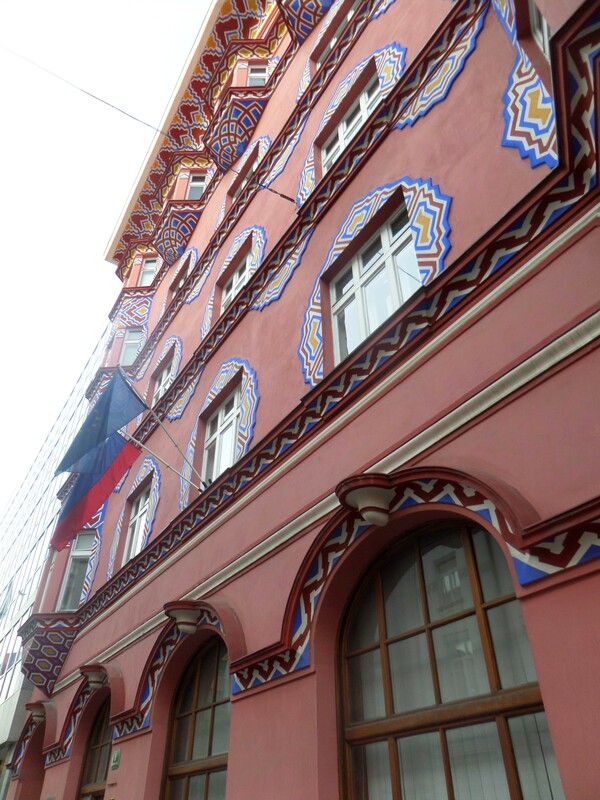 Fortunately the Italians had been in Ljubljana before us and they love painting things pink. I.e. this is the worlds most decorative ‘Game’ store. 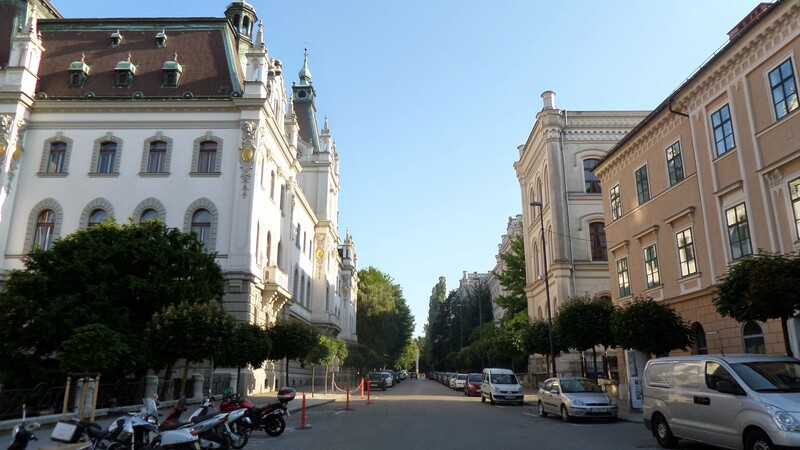 Some pleasant, affluent Slovenian street. And finally this masterpiece, right outside out hostel in the open courtyard. Recognise anyone you know? 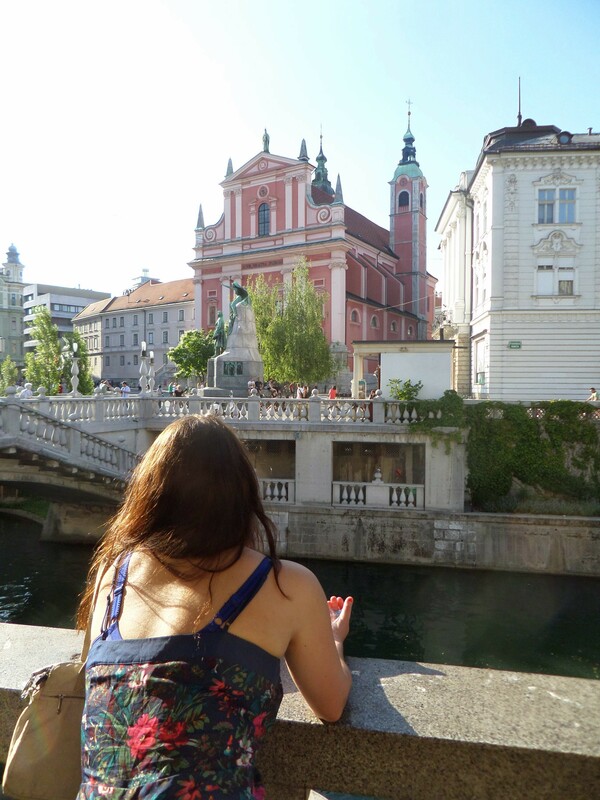 Chilling out to the sound of a bowl of meat and potato, Sarah and I realised Ljubljana was a pretty cool place to be. Slovenia, for that matter, was a pretty cool place to be. Characterful and beautiful. We ducked into a liquor shop on the way to the hostel, beered up and cheery. Sarah wanted to buy my sister a little something by ways of thanks for lending an armoured motorcycle jacket. While she debated my sister’s preference in spirit (pine-cone or peppermint) I was entertaining myself hammering 3 inch nails into a big log – designed specifically for that purpose and no other. It was full of bent heads and it was a moment of pride when my 3rd nail was driven true. Simple satisfaction but enough to put a spring in my step the rest of the short way back. We relaxed under the tented patio, drinking lemon radler beer while two guys set up their guitar and amps. Human beings flitted as the light in the evening sky relaxed into a comfortable purple. The staff lit candles and the band piped up a pleasant Spanish guitar set. I had my head in my tablet, punishing my fingers against the screen, typing out the next post for the blog. Every time I looked up Sarah was enthralled with the music – it was good, but I’d heard Spanish guitar not long ago. – In Spain. It dawned on me how far I’d come to get here on this particular night. I put the tablet down and enjoyed the last couple of songs and last dregs in my bottle. Before trying to follow Sarah upstairs I left my tiny pen drive with the receptionists to format for me. I needed their help getting to the room levels as Sarah took our only key, but I bet they loved the hassling. There was one other supposedly mythical place somewhere in the depths of Slovenia, Sarah had been told about it. 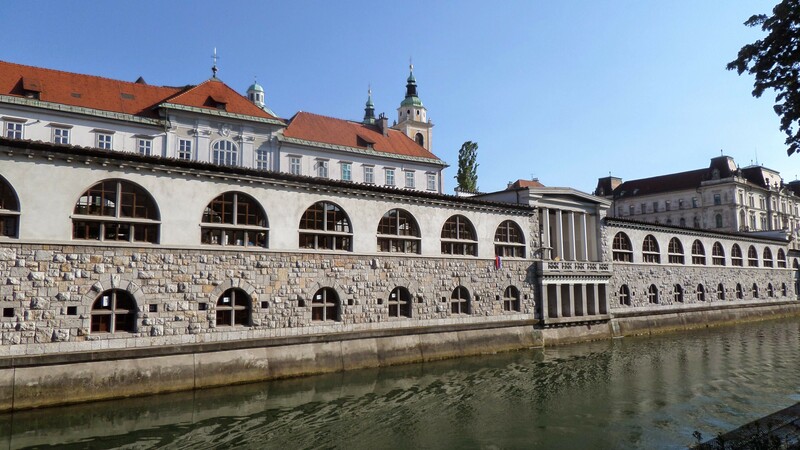 So in the morning, under another days violent sun, we cruised out of the hippy compound resolutely, deciding to be unfazed by yesterdays discovery of Ljubljana’s murky waters. It was one of Sarah’s friends who’d suggested today’s destination and someone I’d met on the road had offered a corroborating story. Lake Bled came highly recommended.